Standing triumphant and defiant against the dark, cloudy sky on Rita Galetti’s album is a metal pole with four spotlights coming from it. It could have been a CCTV camera’ or better yet, a cellular communication antenna which was erected to the sky, as its dark shadowy figure does not surrender enough details to be sure about the nature, if that is the fitting word, of this object. As I am listening over and over to ‘Falter’, which is the Canadian artist’s debut album released by the label ‘Contra Musik production’, I start to see how this picture manifests itself within the music that Galetti offers. These nine tracks, all recorded between 2008 and 2009, form together a collection of drones, varying from soft hums to violent tidal waves. Galetti combines different elements that stand out through these passing drones in the same manner in which rocks pierce the water of a running river. On “Door Mere” Galetti focuses on metallic rings that ripple and bend the organic sounding, breathing drones. Like the metal pole that pierces the purple sky on the album’s cover, the extreme contrast between these two elements on Door Mere almost makes us able to feel the metallic sound through our different senses. Falter, aside from being rich with deep sounds and eerie compositions, is also a very sensual album that provokes not only our ears with its contents. On some of the tracks we can hear guitars, played by Galetti on top, or underneath, her deep drones. Together with he constant electronic hums, we get delicate moments of intimacy of this cozy guitar, drowning in a sea of reverb, such as on the track “Malbaie”. The anti thesis does not wait and comes with full force on the next track, “Swarm Furies”, in a form that is best described in the track’s title. Hostile sounds mix violently together into a massive, filthy and haunting fury. 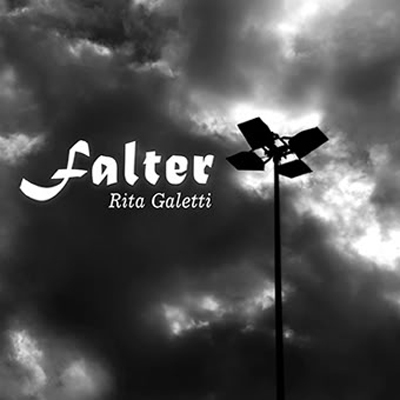 “Falter”, rich with sounds and tastes, let Galetti show different musical faces through numerous sounds and atmospheres that vary from caressing, soft waves to hostile, poisonous sounds. Galetti displays a fine demonstration of intention on her debut album and it pays of to witness this spectacle! rita is incredibly underrated as a canadian experimental artist. glad someone finally picked up on her. nice work.